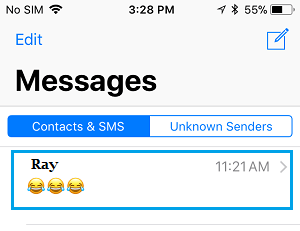 The Messages App on iPhone allows you to Hide Message Alerts from individual Chats, in case you have a reason to do so for privacy or other reasons. You will find below the steps to Hide Messages Alerts On iPhone from Individual Chats. Message alerts on iPhone are liked by most users and they are basically designed to keep iPhone users in touch with their Contacts and what is happening around them. However, once in a while everyone comes across the need to Hide Message Alerts on iPhone for a variety of reasons, ranging from privacy concerns to silencing a particularly annoying Contact. 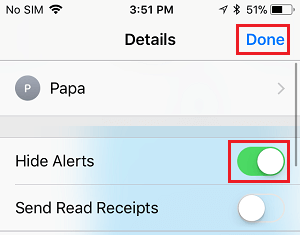 On such occasions, you can make use of the Hide Alerts option in Messages App to Hide Message Alerts from Individual Contacts on iPhone. 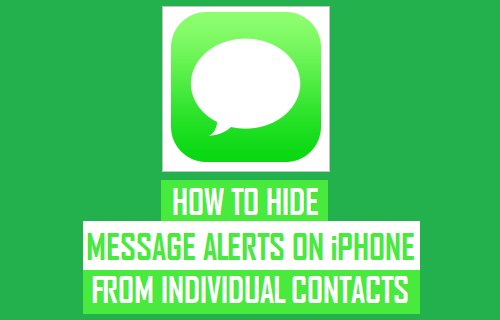 Follow the steps below to Hide Message Alerts On iPhone from Individual Contacts. 1. Open the Messages App on your iPhone or iPad. 2. Open the Chat for which you want to Hide Message Alerts on iPhone. 3. Next, tap on the “i” icon (Details icon) located at the top right corner of your screen. 4. On the next screen, enable the option to Hide Alerts by moving the Toggle to ON position (See image below). After this, you will no longer see Message Alerts from this particular Contact on your iPhone. Instead of going to the Details screen, you can quickly Hide Message Alerts on iPhone from any of your Contacts, right from the Chats screen. 2. Next, swipe left on the Chat for which you want to Hide Message Alerts On iPhone. 3. You will see the options to Delete or Hide Alerts. Tap on Hide Alerts. 2. Next, swipe left on the Chat for which you want to Show Message Alerts on iPhone. 3. You will see the options to Delete Message or Show Alerts, tap on Show Alerts. 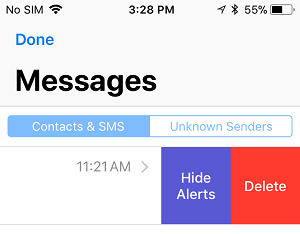 As you must be already thinking, the Hide Alerts option in Messages App can also be used to Hide Alerts from Unknown Contacts and to stop persistent promotional messages from certain services having access to your Phone Number.